I just installed NMM 0.61.13 and tried to launch it and this is what came up. You need to run it as Administrator, right click on it and select "Run as Administrator". I already got this fixed, thanks. I just had to run it again for some reason... must have been some weird hiccup or something. I'm also getting this pop up after trying to reinstall NMM. I always run as administrator & it still does not open... any idea's ?? When you reinstall NMM, you will need to have it set to "Run as an administrator" again. The setting is reset after every reinstall/update. When you install install the drive and correct path where you always install the mod manager. Ready! What? No, sir, we are not Ready. That does absolutely nothing to fix the problem. NMM has some issues but they aren't issues to worry about. 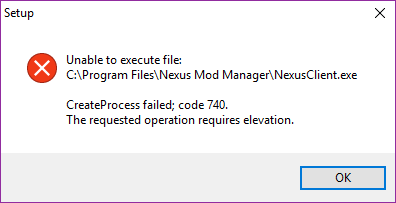 If you get the "update failed" message when you launch NMM and it goes to auto-update, just go to the exe file location and check the version number. It should be fine. It's a false-flag. If you get the 740 error when installing new version from Github, no worries. Just go to the install path, and make sure it's checked to run as admin. Run it from there, NOT from the installer each time. Also make sure you check the "Run as administrator" in compatibility settings IN THE EXE and not in the shortcut. VORTEX 30 errors at once!